Buying a mattress can quickly turn into a stressful situation because of the vast choice. Tempur is one of the leading brands in the market due to its strong reputation. We've created a full guide reviewing the best Tempur mattresses available to buy and what type of sleeper each model is most appropriate for. If you’ve been looking for a new mattress, then you’ve no doubt heard of the Tempur brand. The material for their mattresses was created over 30 years ago by a team of scientists working for NASA who wanted to provide support to astronauts as they took off from earth, and this was how Visco elastic memory foam was born. Once they completed this project, it wasn’t long until they realised that this had great commercial potential and this turned into the Tempur mattresses that we see today. However, despite this revolutionary product, they continue to innovate and improve the product investing millions into research and development. Their in-house team full of certified sleep specialists and sensory exports ensures that they create products that exactly fit the needs of people. Tempur memory foam conforms to the shape of your body to provide custom support to your body while you sleep helping to relieve pressure and tension leaving you refreshed when you wake in the morning. The mattress also works to absorb motion and has enough sink to ensure you feel cosy and warm. The Tempur material is pressure relieving due to its open cell structure that not only absorbs but evenly distributes the weight of your body to decrease strains and aches. Regardless of the position you sleep in, the material softens and compresses to your body shape at room temperature regardless of your regular sleeping position. Its motion absorbing properties mean that if even if you share a bed with your partner if either of you moves, you’re less likely to be disturbed because of the lack of motion transfer. Motion absorption can be measured via rebound where the lower the reading is, the better. 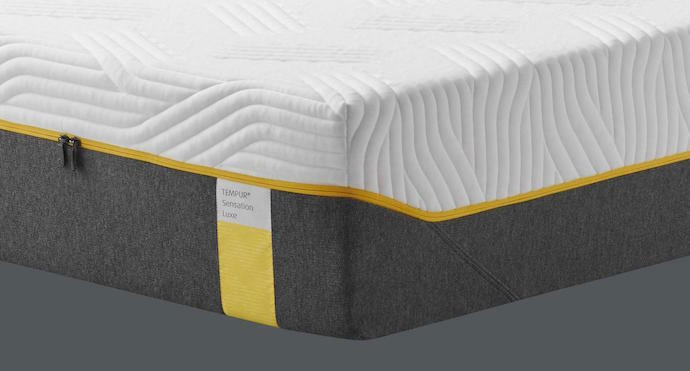 During a study where a weighted ball was dropped on to different mattresses, Tempur had a rebound value of less than 3% whereas the average memory foam mattress has a rebound value of 20%. Each mattress is supplied with a ten-year guarantee to give you added peace of mind that if any defects or issues occur with your mattress, then the manufacturer will be there to support you. The fact that Tempur has been around for decades also makes you more assured that they will still be a trading company if you do need assistance ten years from now. In 10 years of mattress use, Tempur claims that the mattress will retain at least 95% of its original height and not have any lumps or bumps. Because of these size retention claims, Tempur has stated that the mattress doesn’t need to be turned or flipped at throughout its life. Tempur is so confident that the mattress will transform your sleep that they offer a 100 night trial with every purchase through their website. This gives you enough time to decide whether it’s right for you. The days of lying on a showroom bed for 30 seconds to see if you like it are over, and now you can test out a mattress in the comfort of your own home. The mattress has a “QuickRefresh” cover which is not only easy to remove but also machine washable. This means not only can you keep it fresh but also replace it when it eventually gets old and worn as is the case with all bed linen. The cover is made from 98% polyester with the remaining 2% being elastane, so it has stretch and durability while also being comfortable. Tempur Comfort Pillow – Pressure reliving material for support and comfort. Tempur Fit Classic Quilt – Uses temperature regulating technology to keep you warm in the winter and cool in the summer. Tempur Fit Mattress Protector – Waterproof, breathable and extra – thin protector to keep your mattress dirt and germ-free. 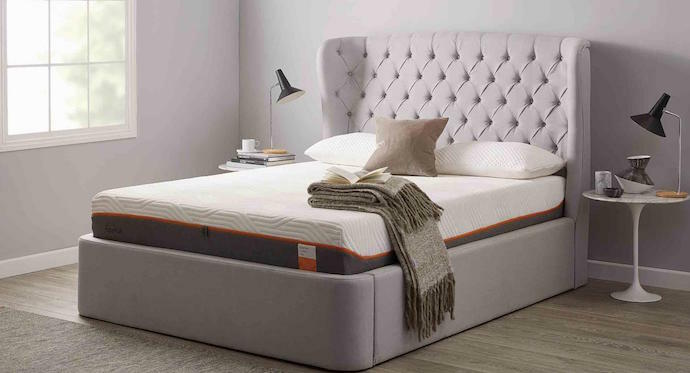 As you may already know, Tempur mattresses are not cheap and depending on the thickness, collection and size this could range from £1000 right up to £3000. That’s a significant amount of money for most people, but Tempur does offer finance packages with up to two years of interest-free credit. Also, you do get the 100-night trial to test out the product and although it may seem like a large amount of money you’re covered for ten years so it’s more of a long term investment so you should look at how much it costs per year rather than the lump sum amount. The general rule of thumb is that the higher the depth, the more support that’s offered because you’ll sink further into the mattress depending on the firmness. This creates more support for your back and joints keeping your body properly aligned. This added sink can make it harder to move throughout the night, so if you move lots throughout the night you need less depth and also if you find that you overheat easily then a thinner cooling mattress would be more appropriate. Generally, a thicker mattress is more appropriate for heavier people; however, with Tempur mattresses, it’s not hugely important because of the overall build quality and durability. The mattress has a weight capacity of 150kg per side which is more than enough for most people s circumstances. You need to consider what existing bed frame you have, because if you have a broad frame, then you need to get a thicker mattress to fit into it. Simply use a tape measure to measure the depth of your bed frame to make sure you purchase the correct sized mattress. As you can see from this guide, the thicker the mattress, the more core technology is included which leads to a higher price. Because of this, you need to consider your budget and how much you’re willing to pay. Tempur mattresses are superior to many other brands because of the cast range of mattress sizes that they offer. This is especially useful if you have a standard sized bed frame and struggle to find a mattress that fits. They have ten sizes ranging from small single up to Super King. Ordering from their site is pretty straight forward and easy to navigate through the different pages and products. Delivery is free; however, you're not given a delivery slot but only a delivery day between 9 am – 4 pm because their home delivery service operates in pre-designated areas only on weekdays. Not only is delivery free, but they also offer free installation on all mattress and bed purchases, so you don’t have to struggle to carry the mattress up your stairs by yourself risking injury. Because Tempur mattresses are so sought after, delivery is usually with 14-28 days but can longer for the less popular sized mattresses. The original Tempur material that’s been around for years that contours to the shape of your body every time that you lay down. It not only relieves muscles and joints but also returns to its original shape once you have finished sleeping on it. Different people require different qualities from a mattress which can be factors such as sleeping position, body weight, existing body pain etc. Because of this Tempur have developed four mattress collections with each collection being suited to different types of sleepers. The mattresses have also been upgraded from an aesthetic point of view introducing a new modern look with a grey cover and brightly coloured trim, with a different colour being designated to each mattress style available. Each collection then has a range of different mattresses, each having different sleep technologies integrated into the material after years of research and development by the Tempur team. Advanced Tempur Material is a slightly firmer version of the Tempur Material, so if you need more firmness to your mattress, then this is for you. It's ideal for back sleepers who need more of a firm material to keep their head and neck supported. This layer provides additional support by not only conforming to your body shape but also working to distributed body weight and pressure across the full length and width of the mattress. Tempur Extra Soft Material provides a cushioning effect to cradle you into the mattress keeping you secure but also limiting the amount of motion transfer so you will not be disturbed if your partner moves throughout the night. One common complaint about memory foam is that some users find they sink too far into the mattress to the point of being uncomfortable. Dynamic support technology avoide this by providing more support allowing you to move around the bed easily. The Micro coils are constructed from cold drawn high-quality steel and are individually pocketed and work independently to react to changes in your body position throughout the night to keep you supported. 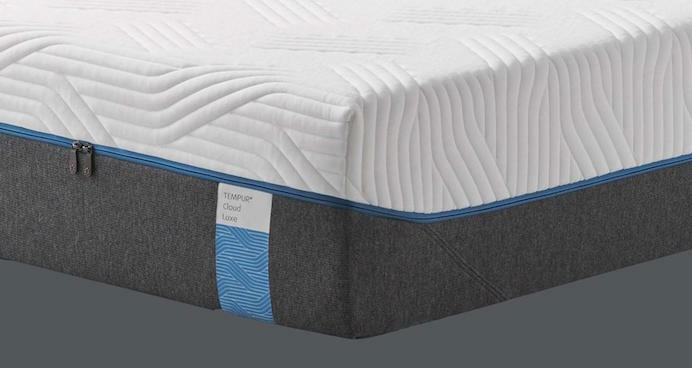 The Durabase technology works with the layers above to increase comfort levels and maintain these levels for the full life of the mattress providing high-class support night after night. Memory foam mattress usually releases a chemical odour when you first unwrap it. This is due to the manufacturing process and is referred to as off-gassing. It’s not harmful, but it can be an unpleasant smell especially if your sensitive to smell. In most instances, you need to leave the mattress in a ventilated area for a few days until the odour dissipates. Tempur mattresses tend to have a stronger than average smell and the denser the mattress, the stronger the scent. This smell is never permanent and only lasts a few days, but needs to be understood before purchasing. The Tempur Cloud has the lowest firmness rating within the range meaning that it’s the softest mattress. The mattress has an additional layer of extra soft material to give an added sinking feeling to relieve your body of tension and pressure. Below this layer is Tempur support foam with a further two support foam layers which provide support. This works to reduce motion transfer while you sleep, and reduce any existing neck or back pain. Similar to the other models there is a Smart Climate System that draws moisture away from your body, so you stay cool throughout the night. 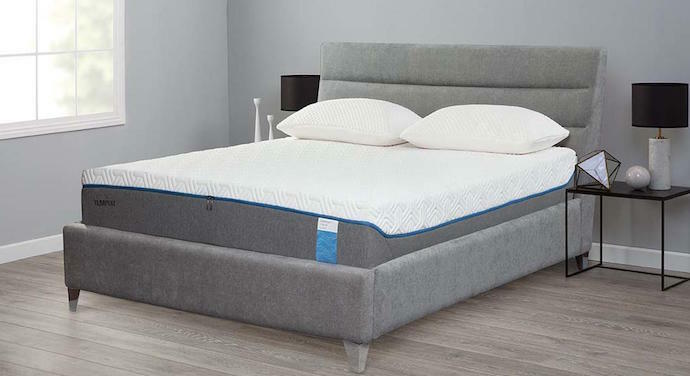 This mattress is ideal for back and side sleepers and has already built up a strong reputation for improving back pain. If you’re a side sleeper or a back sleeper that's looking for a softer feel but still needs supportive sink from your Tempur mattress. 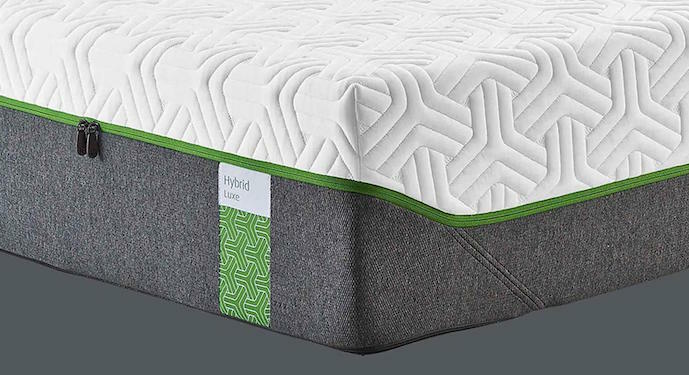 The Tempur Hybrid is the medium firmness rating mattress in the range and uses the same trademarked memory foam material. The mattress is responsive to contours to the shape of your body as you move through the night. The Hybrid has an added layer of precision coils that function individually and together to create a fully responsive layer that is also dynamic and supportive. It’s not surprising to see Tempur have taken the level of mattress innovation to the net level. When the power of the precision coils works with the temperature response layer, this means it reacts to even the smallest movements that you make. This makes your body more supportive, so you wake up in the morning pain-free and rested. It gives the mattress a slightly springy feel, and coils ensure that the mattress doesn’t have too much sink. 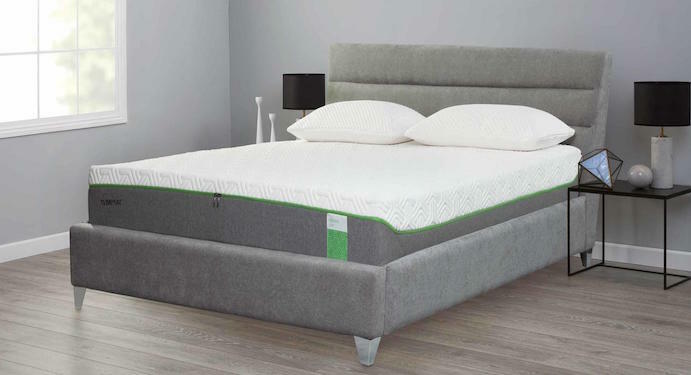 The Hybrid Tempur mattress is best suited to back and side sleepers who also share a bed because the coils decrease the motion transfer and there is increased responsiveness. The Tempur contour Is the equivalent of the Tempur Original, their first model that they released onto the market. Because of its firmness, you don’t immediately sink into the mattress, but it takes a little bit of time as the heat from your body transfers into the mattress. Due to its firmness, it’s best suited to side sleepers as it will conform to your body and give you the greater support you need because you have a lower surface area in contact with the mattress. Despite the sink that the mattress has, you will remain cool throughout the night as the base layer works to disperse and wick away heat. If you’re a side sleeper or a back sleeper that needs the extra firmness to provide support to your body, then this is the mattress for you. 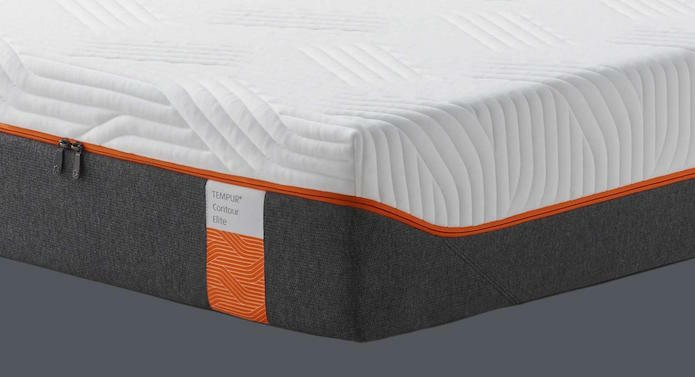 The Tempur sensation gives you a medium feel mattress that still offers superior support but feels more like a regular spring mattress and also is suited if you like the ease of movement. This mattress is especially for those who don’t like the feeling of traditional memory foam, but still, want to experience the benefits. The mattress still works to contour to the shape of your body with four distinct layers; Tempur Comfort material, Tempur support material, Dynamic support technology and Durabase technology. These layers provide more support and comfort while allowing you to move with ease throughout the night with minimal motion transfer. 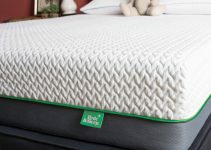 It’s for sleepers who tend to move frequently throughout the night and people who don’t like traditional memory foam but want to benefit for the positives that the material brings. Overall these are effective mattresses; however, the high price can put a lot of people off when there are cheaper alternatives that will still do a fantastic job. See our list of top rated mattresses. However, with the 100-day trial and ten years guarantee it’ worth your while testing the product in your own home to see if it’s right for you.